Capsule wardrobes are novel in theory but, truth be told, they can be a bit limiting. So in an effort to identify the most useful type of capsule wardrobe, we turned to shoes (as we often do). After all, isn't the hallmark of a versatile wardrobe one that can work for a variety of occasions? And in our opinion, the number one thing that makes an outfit work for a variety of occasions is its ability to look good with a variety of shoe styles. 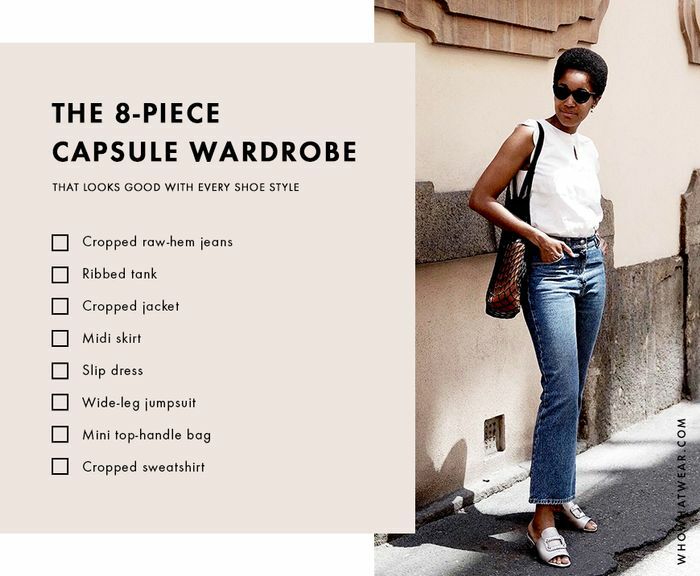 Hence this particular capsule wardrobe: the eight pieces that can be worn together and with any type of shoe, no matter how dressy or casual. To help you achieve versatile capsule-wardrobe success and ultimately simplify your life, we compiled the stylish wardrobe essentials every shoe lover needs, from the skirt style that looks chic with stilettos or sneakers to the jeans even petite girls can wear with flats, ankle boots, or pumps. Read on to shop the aforementioned capsule wardrobe along with some of our current favorite shoes in every silhouette. You can't go wrong with a pair of cropped slim-leg raw-hem jeans. They're perfect for showing off any type of shoe. Ribbed tanks look expensive and you can pair them with all of your jeans and midi skirts. A cropped jacket is ultra flattering when paired with every other piece in this capsule wardrobe. Unlike maxi skirts or miniskirts, midi skirts are as chic with flats as they are heels. A simple slip dress is the perfect choice when you want your shoes to be the focus of your look. Believe it or not, wide-leg jumpsuits are surprisingly versatile when it comes to shoe-pairing. Just make sure the jumpsuit is cropped. A sleek mini bag won't take the attention away from your footwear and can easily be dressed up or down. While an oversize sweatshirt can look sloppy, a cropped, fitted sweatshirt is surprisingly versatile and flattering. Velvet is back again for fall 2017. 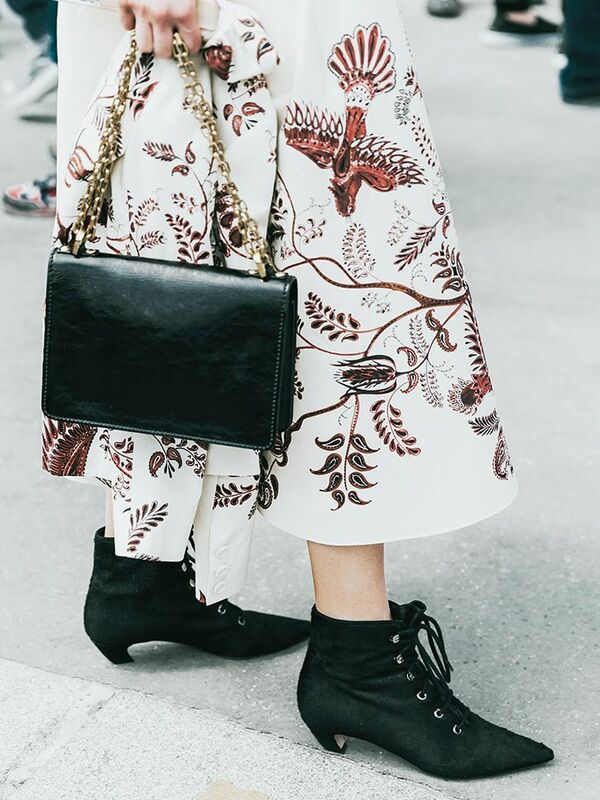 These Tibi ankle boots are already selling out everywhere. This color is so good. The reason every celeb owns these? They're crazy versatile. Bows add a feminine touch to this masculine shoe style. It's still summer, so there are still plenty of opportunities left to wear these. Sparkly shoes were all over the F/W 17 runways. We especially love these with the midi skirt or slip dress in the capsule wardrobe. The perfect transitional off-duty outfit? These with the jeans and sweatshirt. So much more flattering than round-toe pumps. These ultra-affordable kicks are never going out of style. These fishnet sock boots couldn't be more forward if they tried. High heels you can actually walk in thanks to the sturdy block heel and ankle strap. 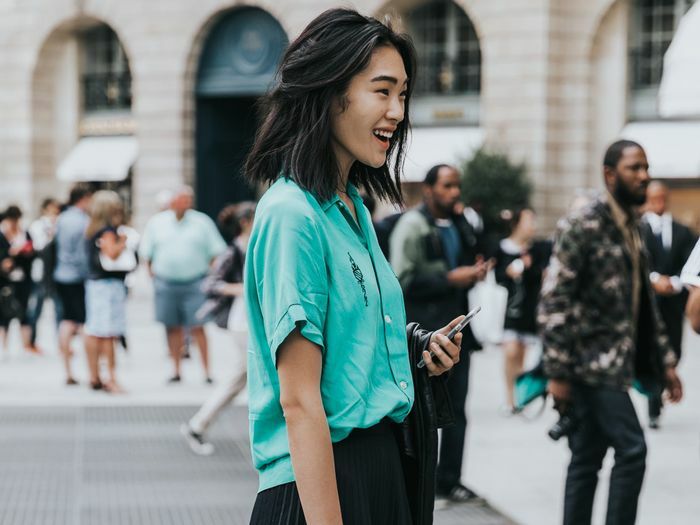 Next, check out nine outfits to wear before summer ends.